The Governing Council of the school was dissolved with immediate effect about a week ago. This follows recent developments at the University that led to students vandalizing property on campus. A peaceful protest by the students on Monday turned violent prompting the Ashanti Regional Security Council (REGSEC) to order the indefinite closure of the University. The government put in place a 7-member Interim Council, also directing that the University reopens within fourteen days to enable academic work to continue. The Interim Council is chaired by Nana Effah Apenteng, Paramount Chief of the Bompata Traditional Area, has a three-month tenure. The University Teachers Association of Ghana (UTAG) KNUST has kicked against the idea, joined by TEWU and other groups who called on government to rescind the decision. The SRC of KNUST issued a statement to support the call by UTAG saying most of their grievances have been addressed for which reason it was needless to dissolve the council. 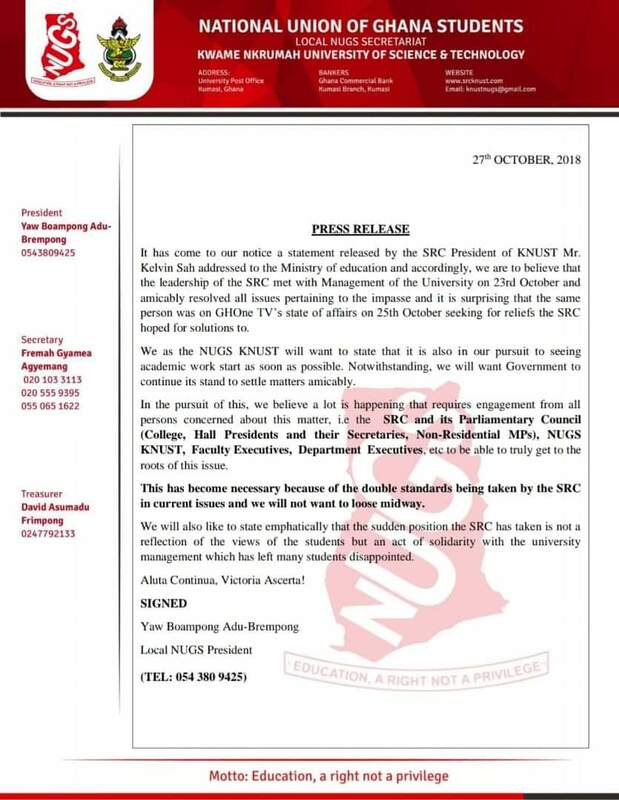 It has however emerged that majority of KNUST students disagree with the stance of the SRC leading to the KNUST NUGS to issue a statement to dissociate itself from the statement by the SRC President who they accuse of going for secret meetings and appearing contradictory on students issues. The NUGS said the stance of the SRC is not a reflection of the views of students on the issues, accusing the SRC of double standards. MyNewsGh.com has also learnt of a grudge between the Executives over some money the Students Council was given for traveling for meetings which has set the executives fighting with NUGS feeling left out. A deep-throat source alleges that the SRC president has been threatened with his grades and personal prosecution for the destruction during the demonstration by the students leading him to follow every instruction he is given. MyNewsGh.com is keenly following for more.